The greatest increase in shareholder value over the last 10 years in the Medical industry comes from the vaccine makers at over 30% ROI per year. 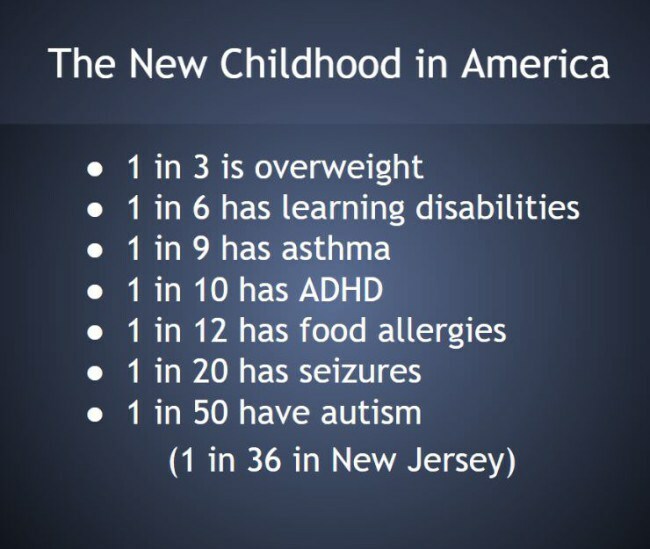 In that same time, Child obesity, autism, allergies, asthma and ADHD have increased to levels never before seen. Co-incidence? Have our children become pin cushions of profit for the drug companies? Here’s the breakdown. You decide. In 1950, there were 3 childhood vaccines typically given when a child entered school. In 1983, there were 10 recommended vaccines by the age of 6 years old (24 doses, 7 injections, 4 oral doses for polio). In 2010, the CDC vax schedule totaled 68 doses with more than half given by the time a child was only a year and a half old. In 2016, the schedule has increased to 74 doses by age 17 with 53 injections and 3 oral doses of rotavirus. These rapid increases in the vaccine schedule mean that a 6 month old baby born today would receive over 2.5 times the number of vaccines as the maximum permitted for a 6 year old back in the 1980’s. And, by the time that same baby was 12 years old, he/she would have received over 7X the number of vaccines as a child born 30 years ago. Predictably, children today are suffering from autoimmune disorders, behavioral problems, and physical disabilities at a rate growing in lockstep with the skyrocketing number of shots. One in every two children suffers from a chronic problem today and the situation is only growing worse with each passing year. The CDC will never stop adding to the immunization schedule as long as pharmaceutical manufacturers are protected from ALL liability of injury and death. There are currently 271 new vaccines in the pipeline just waiting to be finalized and gain approval from the FDA (1). There is absolutely no incentive to make existing or new vaccines safe or keep the schedule at a reasonable level since the passage of the 1986 Vaccine Injury Act (2). 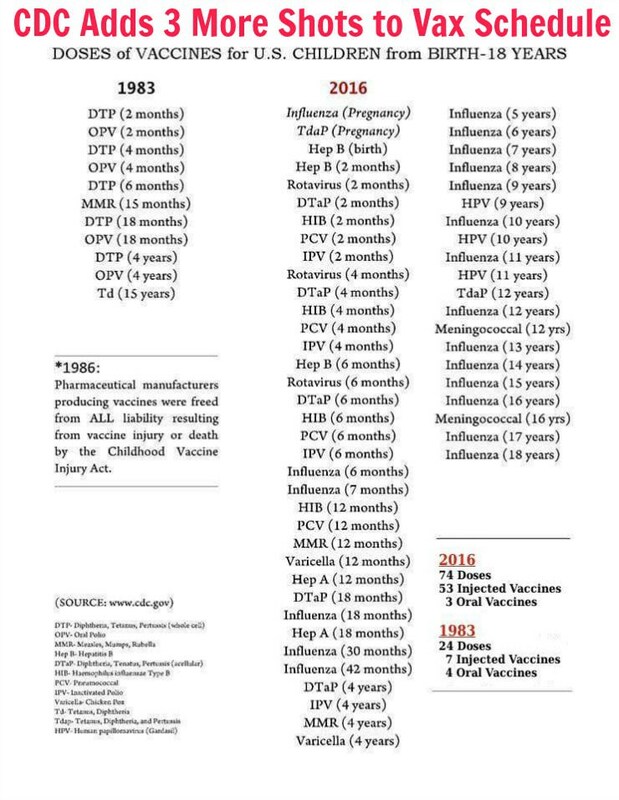 Will you be following the newly revised CDC Childhood Immunization Schedule or have you concluded as I did 18 years ago that the risks to your child’s long term health from following this insane vaccination schedule far outweigh the small risks of not vaccinating (3)? In the 2016 CDC immunization chart, a row has been added for the new meningococcal B vaccine. It contains a purple bar denoting the recommendation to vaccinate certain high-risk persons aged 10 years and older and a blue bar denoting the recommendation for administration to non-high-risk groups subject to individual clinical decision making for individuals aged 16 through 23 years (the preferred age range is 16 – 18 years). For human papillomavirus immunization, the new vaccine nomenclature has been changed to “9vHPV,” to denote Merck’s Gardasil 9, which was licensed in December 2014 to replace the prior 4-valent version. On the chart, the HPV row contains an additional purple bar from age 9 to 10 years, denoting a recommendation to vaccinate high-risk children in that group, including those with a history of sexual abuse. ← A Message to All Who Believe They Vote for President; Can You Delegate A Right You Do Not Have? What is the source for “The New Childhood in America” meme, please? Thanks!